On the SPOT marketing services managed by BeCreative360 was built by SPOT for the operator that does not want the hassle of the daily or weekly processes required to carry out a consistent and full featured marketing campaign. The OTS marketing service takes advantage of your current branding and will deliver full featured customer contact marketing. Take a look at BeCreative360.com or click below and review the long list of automated emails available to you. 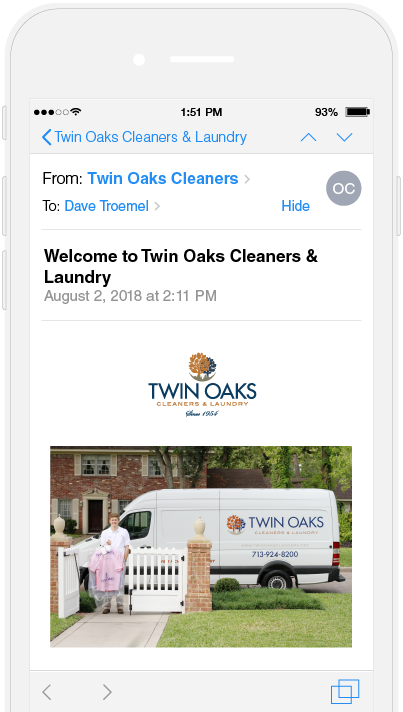 By default, OTS campaign’s communicate with your customers via email. You also have the option to integrate SMS and print into your OTS communication offering. Let us show you why OTS has become one of our most popular options in the SPOT community. For more details on OTS options please contact sales@ spotpos.com or create@becreative360.com. Coupons - SPOT supports printed ad coupons with bar coded coupon numbers. Only scanned coupons will receive a discount in SPOT. Coupons have six defined types to provide a wide variety of customizable marketing programs and can be applied by department, day, time-of-day, and item. Promotions - Automated promotional programs can be created as a single one-shot event or accumulated over time to increase customer loyalty and enhance visit frequency. For example, you could offer to clean 50 pairs of pants over a three-month period and, if the customer qualifies, he would receive three additional pairs cleaned at no charge. The accumulation of the 50 pairs of pants and subsequent promotion award is automatically tracked by SPOT...you set it and forget it! Discounts - Line item discounts provide an alternative to Coupons and Promotions. These are frequently used to handle price adjustments for commercial and wholesale accounts, but can be used in a variety of other ways. Discounts can be defined to apply to specific departments. Customer Rewards - This is an internal SPOT frequent buyer program that accumulates points by department and automatically issues Rewards in the form of cash credit, A/R credit or printed redemption coupons at the time of pickup. This is a rules-based program allowing you to decide the number of points awarded by department, when the Reward is reached, and the value of the Reward. Referral Source - Keep track of where you receive new customer referrals for potential incentives by those referring your business. Charity Programs - Tracked within SPOT by dollars spent at pickup with totals reporting on invoices and standard reports. SPOT tracks the percentage of sales for donation commitments with expirations by charity type. Retention Marketing - Identifies customers who are out-of- frequency by at least 25&percnt; of normal visit frequency as a way to retain existing customers by using retention letters and specials. After all, it costs less to keep an existing customer than prospect for a new one!